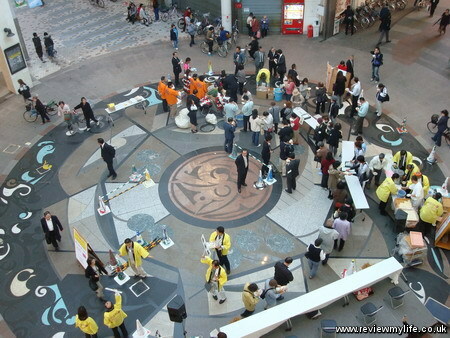 Free udon queue in Takamatsu! Kagawa prefecture in Japan is the home of the famous Sanuki udon. If you tell any Japanese person that you have been to Kagawa then 9 times out of 10 they will ask you not about Ritsurin Park, or the Kotohira Shrine, but about the udon. The Japanese love their udon, and the Sanuki udon from Kagawa are considered to be the best. Japanese tourists travel to Kagawa just for the udon. You can even get a guide book listing the ‘101 best udon restaurants in Kagawa’ – that’s an indication as to how many udon places there are. For the uninitiated udon are wheat noodles that can be served in a variety of ways; usually with fish sauce (dashi), and fish, meat, spring onions, eggs, or tofu toppings. 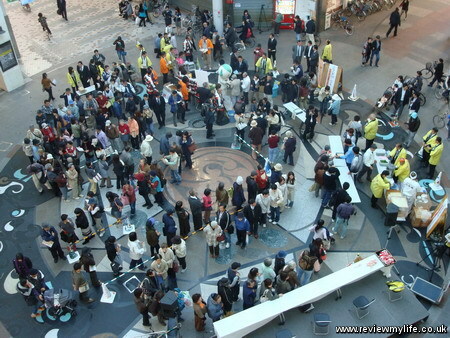 One day as I was walking past the big dome of the Marugamemachi I spotted this free udon queue. A new udon restaurant was opening and they were giving away free udon to publicise it. 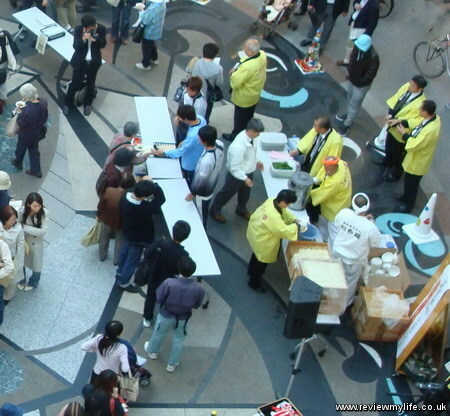 Throughout the time I was watching there was a continuous stream of new people arriving to get their udon. Let’s take a closer look at the queue. 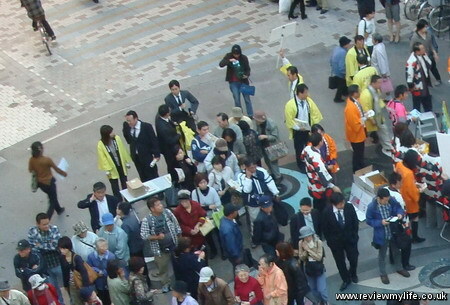 Men wearing yello jackets wave signs that tell the shoppers this is a queue for free udon. 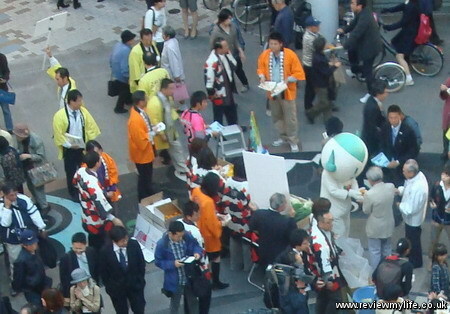 The shoppers eagerly join the queue and are given some promotional material for the restaurant. The shoppers patiently snake their way around the queue. One of the men in the yellow jackets kept on rearranging the barriers for the queuing system, probably so he could look busy! The shoppers reach the udon station. Here a production line of staff puts the udon in the bowls, adds some spring onion topping, and then hands the bowl of the udon to the next in line along with some wooden chopsticks. 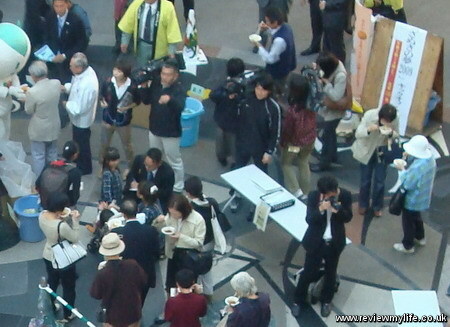 After getting their udon the shoppers quickly eat them up (lots of slurping is considered the polite way to eat them). It looked like they were enjoying the udon. Then the shoppers could move a bit further along and get an orange or two, as well as having their photo taken with someone in a cartoon character costume. 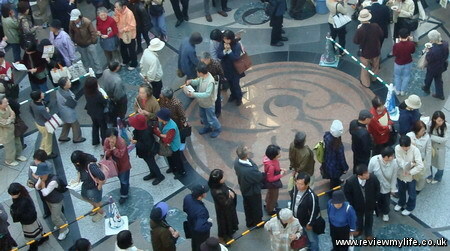 What a lot of people then did was run around back to the start of the queue to get more udon! The staff seemed happy to let them do this as they had huge crates full of udon portions ready to serve. Here’s a video of some of the event. And finally here a photo of what it looked like after the crowds had died down. This entry was posted on Thursday, December 30th, 2010 at 5:11 pm and is filed under Japan. You can follow any responses to this entry through the RSS 2.0 feed. You can leave a response, or trackback from your own site.